Below you can view all the highrises for sale in the Streamline Tower subdivision located in Las Vegas Nevada. Listings in Streamline Tower are updated daily from data we receive from the Las Vegas multiple listing service. To learn more about any of these highrises or to receive custom notifications when a new property is listed for sale in Streamline Tower, give us a call at 702-323-5986. Open floor plan, floor to ceiling windows,terrace & spectacular Strip and City views all around and much more Must See ! MLS#2088944. Platinum R.E. Professionals. The property was setup for corporate rentals and meticulously maintained. MLS#2083612. Legacy International. Steps away from restaurants, art galleries, entertainment & FUN! Easy freeway access. MLS#2084754. Home Connect America. Balconies, Custom Master Bath/W Full Tub And Walk In Closet!,Stainless Appliances!, Granite!high Rise Life!, Rooftop Pool, Spa, Skydeck, Bbq, 24hr Fitness Center, Social Lounge, Concierge, 2 Private Parking Spaces, To Much To List!, Jack And Jill Bath In Guest Rooms, Custom Lighting, Ready For All The Best Of Las Vegas! A Must See! MLS#2081611. Topper Properties. Don't let this one pass you up! MLS#2079972. Foster Realty. Take the elevator downstairs to join the fun just footsteps away and when you're ready to relax in your new home the views will take your breath away. MLS#2078186. BHHS Nevada Properties. You must see to believe this one! MLS#2078245. BHHS Nevada Properties. On-site bar/lounge, 2 restaurants, beauty salon, rooftop pool/spa/sky deck. Furniture negotiable. MLS#2076040. Realty Now. 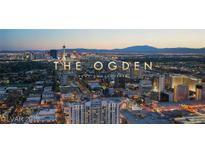 Live,work, play in one of the most talked about high rises in Las Vegas ! Must See ! MLS#2076024. Platinum R.E. Professionals. With gorgeous wood flooring throughout, beautiful quartz counter tops and stainless steel appliances, modern and slick design, this condo is what you've been looking for! MLS#2074261. Nationwide Realty LLC. Enjoy life with breathtaking views, convenient amenities, seamless efficiency and modern designs. Welcome to 1102. Welcome Home! MLS#2069902. Listing Haven. Located downtown Las Vegas - Amenities include 24/7 Concierge Services, Fitness Center, Rooftop Pool/Spa, Sky Deck, Pet Park, & much more. MLS#2062562. BHHS Nevada Properties. Fully Furnished and ready to move in! MLS#2061301. Huntington & Ellis, A Real Est. Master Bath Includes Double Sink & Walk-in Shower. MLS#2061200. Keller Williams Market Place. Live your highrise fantasy~ This won't last long! MLS#2058432. Keller Williams Market Place. 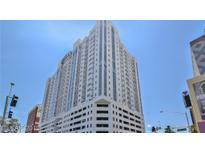 Condo unit is lowest sell Price per Sq Ft in Entire Building! ! MLS#2057921. TR Realty. Fully Furnished**strip View**overlooking The Fremont Experience**one Bedroom High Rise Condo** balcony From Living Room**move In Ready**roof Top Pool, Spa And Terrace With Bar B Q And Lounging Area To Kick Back And Enjoy The Fantastic View!! ** MLS#2046310. Elite Realty. Amenities feature a rooftop pool, Sky deck, pet park, ground floor dining, concierge services & much more. MLS#2026693. Platinum R.E. Professionals. Secured Parking and Secured Entry. Financing available! MLS#1966807. BHHS Nevada Properties.